We look at the recent upsurge in student activism on campus, part of the #Occupy movement, in particular #OccupyTowson. 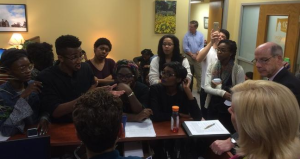 Last Wednesday a group of Black Towson University students brought a list of demands to Towson’s interim President Timothy Chandler and talked with him until after midnight, when he pledged to address their concerns. With: Korey Johnson, member of the first debate team of Black women to win a national championship (2014), youth advocate for Leaders of a Beautiful Struggle, and one of the organizers of the Towson occupation; and Dayvon Love, Towson University alumnus and Director of Research and Public Policy for Leaders of a Beautiful Struggle.